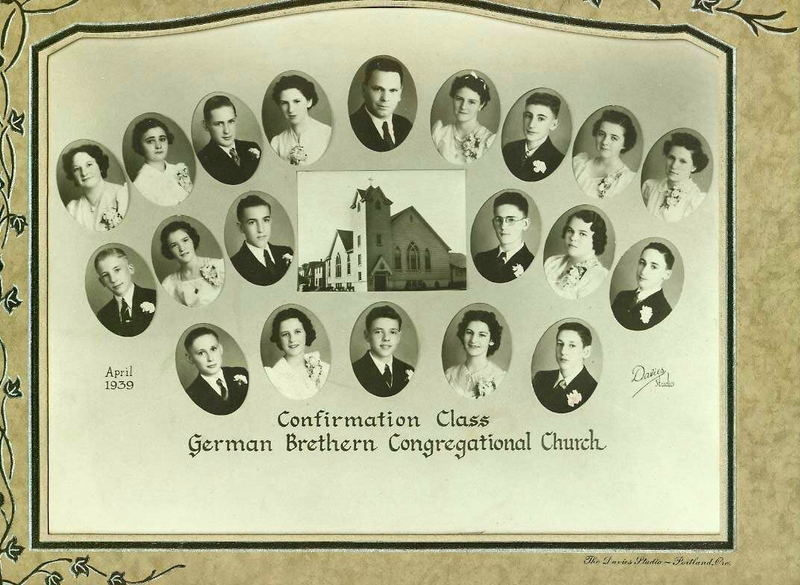 The German Congregational Evangelical Brethren Church Confirmation Class of April 2, 1939. Top row from left to right: ?, Elisabeth (Betty) Niederhaus, ?, Virginia Mae Glanz, Rev. Edward Graumann, ?, Reinhold Piel, ?, Amalie (Molly) Jacoby. Middle row from left to right: ?, ?, ?, ?, Eileen Helene Geist, ? Bottom row from left to right: ?, ?, ?, ?, ? Unidentified members of the 1939 confirmation class: Roy Traut (Traudt), Henry Hinkel, Lucille Hinkel, Ruben Maier, Dafney Irine Glanz, Johannes Schlitt, Jack P. Atkins, Henry Miller, Ethel Miller, Evelyn Schillereff, Edward Jacoby, Henry Deletts, Donald Pfenning, David Scheirman. Photograph courtesy of Marcia Fox whose grandmother, Molly Jacoby, identified Betty Niederhaus, Virginia Glanz, Reinhold Piel and Eileen Giest.